The BBC has outlined its vision of the future at a keynote speech held at MIPTV-MILIA event today, with much of its focus devoted to its online media player, the BBC iPlayer. Ashley Highfield, director of the BBC's Future Media and Technology division said that it was the corporation's duty to make itself universally available to anyone in the UK who pays a licence fee, and that its content should be available on as many different platforms as possible. "On the internet, we already make our content available in different bandwidths for those with fast and slow connection speeds, different video players for those who use Microsoft or Real , but we can and must do more. 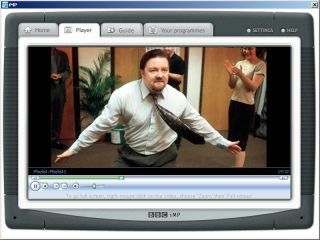 "Apple computers for instance: although their proprietary and closed framework for digital rights management gives us headaches, it is one of our top priorities to re-engineer our proposed BBC iPlayer service to work on Macs." Highfield also said that delivering just audio or video content wasn't enough: viewers expected programme metadata - "the cast-lists and behind-the-scenes programme information, the scripts, the whole nine megabytes" - as well. The BBC says its iMP trial showed that the iPlayer could account of 10 per cent of the BBC's audience figures in broadband homes. They also said there has been nearly four million downloads since their video podcast trial began last August. The corporation says its iPlayer roll-out would target the UK's 22 million broadband users first, followed by Britain's three million cable TV users, then Mac, entertainment PC and handheld device users. The BBC said the trickiest challenge would delivering the iPlayer to people who receive digital terrestrial TV either via personal video recorders (PVRs) or by using hybrid IP boxes. The BBC expects a final decision on whether or not it proceed with the iPlayer launch at a meeting with the BBC Trust in May.